Our program for Court Reporters and Stenographers offers some of the broadest coverages available and is written nationwide on Occurrence Forms. Court reporters and stenographers create verbatim transcripts of speeches, conversations, legal proceedings, meetings and other events. 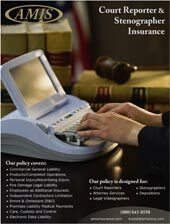 Written accounts of spoken words or legal transcription are essential for correspondence, records, or legal proof, and court reporters provide those accounts. Court reporters play a critical role not only in judicial proceedings, but also at any meeting where the spoken word must be preserved as a written transcript. They are responsible for ensuring the accuracy of court transcripts and for providing a complete, accurate, and secure legal record. In conjunction with preparing and protecting the legal record, many court reporters assist judges and trial attorneys in numerous ways, such as organizing and searching for information in the official record or making suggestions to judges and attorneys regarding courtroom administration and procedure. Increasingly, court reporters provide closed-captioning and real-time translating services to the deaf and hard-of-hearing community. Mistakes happen. Make sure that you have the coverage you need! 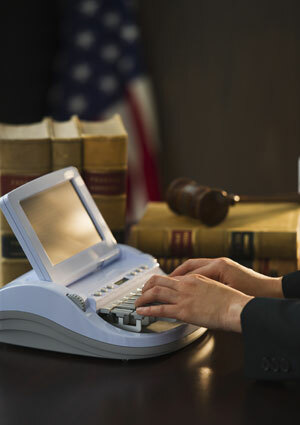 There are several methods of court reporting, but the most common is called stenographic. Using a stenotype machine, stenotypists document all statements made during official proceedings. The stenotype machine allows them to press multiple keys at once to record combinations of letters representing sounds, words, or phrases. These symbols are electronically recorded and then translated and displayed as text in a process called computer-aided transcription (CAT). In real-time court reporting, the stenotype machine is linked to computers for real-time captioning, often of television programs. As the reporter keys in the symbols, the spoken words instantly appear as text on the screen. Another method of court reporting is called electronic reporting. This method uses audio equipment to record court proceedings. The court reporter monitors the process, takes notes to identify speakers, and listens to the recording to ensure its clarity and quality. The equipment used may include analog tape recorders or digital equipment. Electronic reporters and transcribers often are responsible for producing a written transcript of the recorded proceeding. Voice writing that is another type of court reporting. Using the voice-writing method, a court reporter speaks directly into a voice silencer—a hand-held mask containing a microphone. The mask prevents the reporter from being heard during testimony as the reporter repeats the testimony into the recorder. Voice writers record everything that is said by judges, witnesses, attorneys, and other parties to a proceeding, as well as gestures and emotional reactions. Written transcripts are prepared afterwards from the recordings. 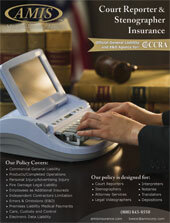 because we deal directly with the insurance company on your behalf. According to United States Department of Labor, court reporters are responsible for a number of duties both before and after transcribing events. Stenographic or voice-writing reporters must create and maintain the computer dictionary that they use to translate their keystroke codes or voice files into written text. They may customize the dictionary with parts of words, entire words, or terminology specific to the proceeding, program, or event that they plan to transcribe. After documenting proceedings, stenographic reporters must edit the computer-generated translation for correct grammar. All reporters are responsible for accurate identification of proper names and places. Electronic reporters ensure that the record or testimony is discernible. Reporters usually prepare written transcripts, make copies, and provide information from the transcript to courts, counsels, interested parties, and the public on request. Court reporters also develop procedures for easy storage and retrieval of all stenographic notes, voice files (commonly referred to as "stenograms"), or audio recordings in paper or digital form. We normally will issue a quote within 24 hours. Retail brokers can submit an application for our consideration.